This room went from being my least favorite in the house to my absolute favorite spot. All it took was a little paint, a little paper, a whole lot of ‘brightening’ and some cozy and soft accessories. I must admit, I was working with some pretty good bones. 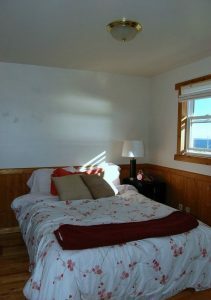 The room is the smallest in the house and can basically only fit a queen bed and two teensy side tables, but the ocean view is million dollar. Here’s what the room looked like when we moved in. It just felt so dark. And not at all like the coastal vistas just outside. My makeover started by addressing that. I painted out the pine wainscoting in a gloss white and then freshened the walls and ceiling in the same white colour, but in an eggshell finish.